The following is a transcription of the Lansdowne Cemetery located on McLeery Road in Spallumcheen, British Columbia, Canada. 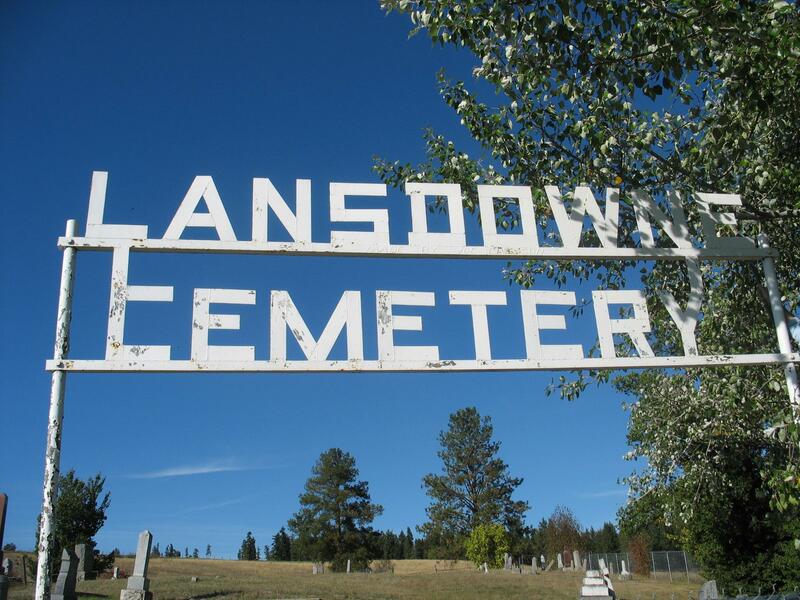 Latitude: 50o 28' 23.23" N.
Longitude: 119o 09' 23.64" W.
The Lansdowne Cemetery is located in the Municipality of Spallumcheen which has served numerous settlements in the North Okanagan for over 100 years. The first interment was in 1882 and the last in 1999. The village of Lansdowne was located on the bench above the valley where Armstrong is now located. With the coming of the railway in 1892, the route selected for the Shuswap and Okanagan railway bypassed the village. As a consequence the village of Lansdowne disappeared. Many of the buildings, including the Anglican Church, were eventually moved to the community of Armstrong. Prior to 1913 when the Armstrong Cemetery opened, the citizens of Armstrong were buried at Lansdowne. The land used for the Lansdowne Cemetery was donated by Herman Wichers. The Lansdowne cemetery continued to be used into the 1940's and still allows cremation remains to be interred. The Lansdowne cemetery is 0.88 acres in size. 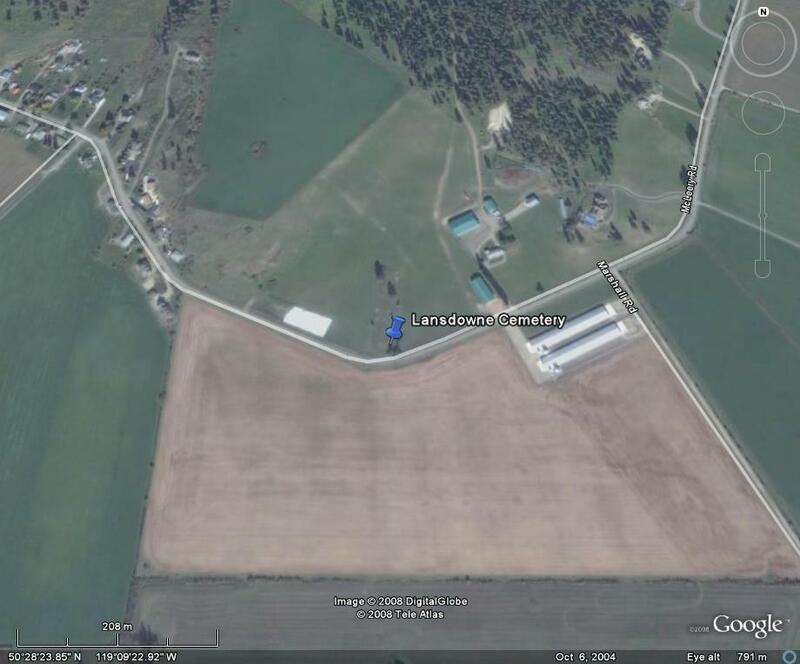 The legal land description is Legal: "B" Plan B638 W 1/2 Sec 5 & E 1/2 Sec 16 TWP 35 O.D.Y.D. 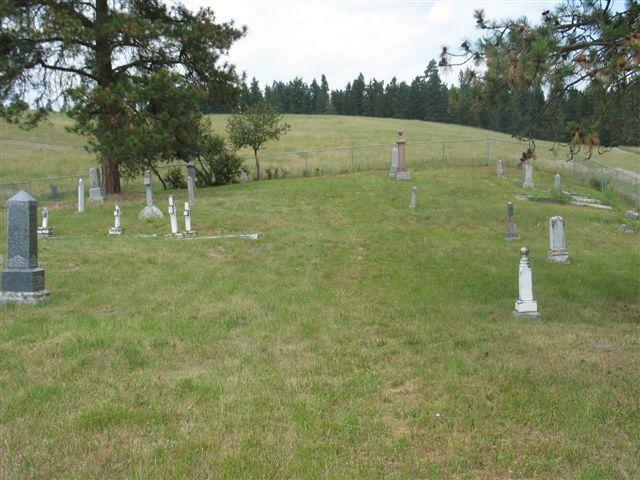 This is a Pioneer Cemetery with a chain link fence surrounding the burying ground. An Armstrong youth group has taken good care of the cemetery and are in charge of mowing the grass. There are a number of wooden markers that are no longer legible. Along Highway 97A turn north Lansdowne Road. This intersection is approximately 1.4 km past the Highway 97A and Smith Drive intersection to proceed into the City of Armstrong. Stay on Lansdowne for 2.8 km, turn east (right) onto McLeery Road and in 0.5 km you are at the cemetery gate.